Aside from the less favourable Tarot cards that most of us don’t wish to see in our readings, do you have one or two that make you feel uncomfortable when they appear? Try as you may, whenever you see that card you can’t help but feel a negative response or strong aversion – even if it seems to have little to do with the traditional, or author’s given interpretation. As we’re building a relationship with our deck we want the cards to provoke an internal response from the images, but we also want to remove any negative bias we may be feeling, so we don’t project our personal fears onto our clients in their reading. We also want to feel totally comfortable with our deck. This is a nice easy exercise to remove any little mental monsters that may be trampling around in your mind, connected to cards that provoke a strong negative association for you personally. It isn’t difficult to do and it’s worked well for private students I’ve shared it with. 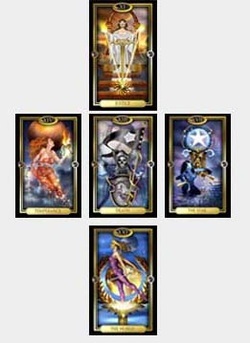 Temperance, The Star, Justice, The World, and Death card from your deck. A metal or fireproof container and matches. If you normally work with a crystal when you use your cards then you may wish to have this on the table as you go through the exercise, you can also light a white candle if you want to, although this is completely personal choice. What does it make you feel? As you may have gathered, this isn’t a writing exercise, the intention is to scribble down all the negativity that you’re feeling when you see this card, until you’re spent. Try not to analyse whether your thoughts or feelings are rational or logical, and no one will see what you write because we’re going to destroy the sheet afterwards! You may discover a few things whilst you’re writing that you hadn’t previously realised, thoughts or feelings you’ve kept tucked away. There’s no need to edit what you’ve written – just keep going until you’re satisfied that you’re completely done. (By that I mean you’re not going to walk away still recounting your thoughts afterwards.) Once finished, read back through it just to make sure there’s nothing further you want to add. Place Temperance and The Star, either side of your disliked card. Both these cards represent healing. Next, place Justice above the card and The World below it. Justice is for balanced thought and The World for successful completion. Then place the Death card directly over the top of the disliked card. You’re now going to burn the piece of paper with your writing on (safely please)! You may need to do this outside in a safe container. As you watch it burn know that your concerns are going with it. Once the ‘ashes’ are cool remove them from your home. You should be feeling lighter already! Now this is done it’s important to no longer think about what you wrote – those thoughts are gone now, up in smoke. Thank your cards for their assistance and place them back in the deck but leave Temperance and The Star either side of the original card as you put them back into the stack overnight. If you wish, before you begin this exercise, you could scan Temperance and The Star together onto a piece of paper and then place it under your pillow that night. Leave at least one full day before you start on the next card, but systematically work through the cards you strongly dislike in this way. After you’ve completed your list of ‘negative’ cards leave about a week and then return to the first card you dealt with. If you’re keeping your Tarot diary or journal, take a diary template for the card and start anew with your interpretation but leave out the section for personal experiences. Remember, it’s only a card, and you should hopefully find it no longer bothers you in the same way when it appears in your readings.